Just a few pictures from the last two weeks to show you how Max has grown….here he is after his first sponge bath last week. His umbilical cord fell off this morning, so from now on he gets real baths! He looks so tiny in his car seat! 1. Max is much more alert now! He will hold eye contact with you for longer periods of time, and will let us play little games with him. 2. 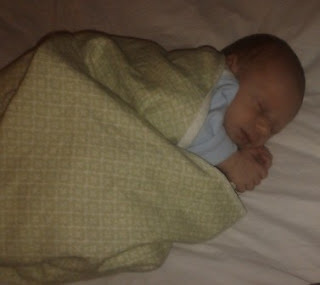 No more umbilical cord….he has a real belly button now! Was it pregnancy hormones when I got a little choked up that he had lost his last connection to being in my belly??? 4. Diapers, diapers, and more diapers. I got peed on for the first time this morning. Actually, it wasn’t just me…he managed to get his own belly, over his head, the fresh diaper that I was trying to put on, the changing pad cover, and the basket with diapers in it. Oh, and the adorable new jumper that I had just put him in. Fantastic fun folks. It’s amazing how a little guy can pee that much…and that far!